Tomorrow, National Eating Disorders Awareness Week (NEDAW) begins. 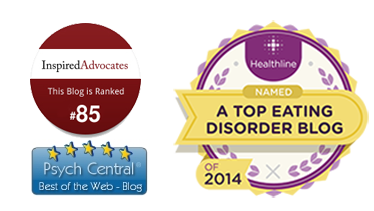 NEDAW is a public health initiative designed to educate people about eating disorders. While I applaud the good intentions and effort that go into planning and executing NEDAW, I will not be participating in any of the events. I do not believe that the messages conveyed during NEDAW are particularly helpful: instead of correcting the myths and misconceptions associated with eating disorders, NEDAW just seems to perpetuate them. •	The environment causes eating disorders by making people feel dissatisfied with their bodies. •	People develop eating disorders because they are insecure, vain, shallow, appearance-focused, or overly influenced by the media. •	By altering the messages people receive from their environment and eliminating the “thin is in” culture, we can prevent or cure eating disorders. •	Overcoming an eating disorder is about reconsidering unhealthy attitudes or behaviors. •	If you have a friend or family member suffering from an eating disorder, you should try to inspire him/her to reconsider his/her unhealthy attitudes and behaviors. •	The unhealthy attitudes and behaviors associated with eating disorders are willful and consciously chosen. Of course, none of these statements are explicit, but they don’t need to be – the public will draw these conclusions on their own. I wholeheartedly agree that our culture is toxic and that the messages we receive about body image, beauty, food, and sexuality are horrific and damaging. I do not object to these principles at all – quite the contrary – but I do object to focusing on these messages during National Eating Disorders Awareness Week. The current public health message associated with eating disorders awareness week is something akin to “Girls are dying to be thin, so let’s all love our bodies!” The themes of NEDAW revolve around thinness, body image, and the media. The concept of psychiatric illness is lost. Of course, it does not help that most eating disorder treatment professionals, eating disorder organizations, tabloid magazines, and recovering eating disorder patients espouse the same body-image centered messages. •	Most symptoms of anorexia nervosa and bulimia nervosa are triggered or perpetuated by malnutrition. For those who are biologically vulnerable, dieting can trigger a cascade of self-perpetuating symptoms which lead to life-long psychiatric disability or death. •	Body dysmorphia is a symptom, not a cause, of an eating disorder. It is not present in all eating disorder patients, and it bears little relation to the typical woman’s body image distress. •	Early, aggressive intervention offers the best hope for full recovery. •	An eating disorder is a brain disease, not a weight problem. 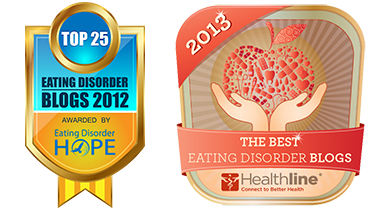 •	There are a variety of methods for treating eating disorders. Most of the eating disorder treatment available is NOT based on current science or evidence-based practice. Patients and parents must be proactive in finding effective treatment. •	Anosognosia – a neurologically-based inability to recognize one’s illness – is a symptom of Anorexia Nervosa. Therefore, patients should not be expected to “want to get well.” It is up to the patient’s loved ones and clinicians to ensure that he/she gets appropriate treatment as soon as possible. These are the points that the public needs to hear. These are the points that will truly change the way eating disorders are perceived. There are many eating disorder treatment professionals out there who will participate in a NEDAW walk or rally, or wear a “Love your body” T-shirt, or attend a screening of “America the Beautiful,” and then head to the office to practice outdated, ineffective treatment. Next week, I will be promoting eating disorders awareness by providing my patients with the most current, evidence-based information and treatment, and by spreading scientifically-sound information through my blog and through my conversations with people. Please join me! This entry was posted on Saturday, February 25th, 2012 at 10:48 am	and is filed under Biologically-Based Mental Illness, Eating Disorders. You can follow any responses to this entry through the RSS 2.0 feed. Both comments and pings are currently closed. I am glad to join you! Your “ideal public health messages are golden. I am right in line behind you! Thank you. Just THANK YOU! I live in the UK, but have been exposed to some of NEDA’s guff (albeit well-meaning) on Facebook and various other sites over the past week. I found myself cursing at my computer, even though my poor computer is not responsible for all this airy-fairy stuff. Great post, you have pointed out some great points, I as well think this is a very great website. I cannot say thank you enough for posting this! I can’t count the number of times I have read this post now, or cited it in conversations. It is so frustrating, as someone with anorexia, to constantly hear people liken EDs to disordered eating produced/heavily influenced by media messages about weight and shape. As if I need to feel more ashamed about myself by also hearing that I’m vain; I’m choosing to do this to myself; I just haven’t figured out how to cope; I’m too impressionable; I’m misguided; I’m shallow; I just need to accept myself. How is it that so many people—even those involved in the treatment of anorexia—seem unable to understand it as a mental disorder (like, say, schizophrenia)? You wouldn’t tell someone to reconsider having hallucinations or say that maybe, if we sent better messages in the media, we could fix this problem of people developing delusions. The media environment is definitely damaging, yes, but it shouldn’t be the focus of a week where we are striving to raise awareness and educate people about a complicated mental illness whose epidemiology is, in fact, multifactorial and, also, strongly linked to genetics. I have been completely overwhelmed by the misconceptions people have about this disorder, and feel so ashamed by what people must assume about me, as someone with anorexia, based on what they think they know about it. I find a lot of solace in your blog, so thank you. A friend of mine and I gave some presentations and workshops in honor of NEDAW for the first time this year, and your message is EXACTLY what we tried to send to our audiences. Although, I can only hope we did as good of a job as you have done here. We both completely agree with what you’ve said, and we try to gently correct people when they talk about eating disorders as something that’s so easy to prevent if we would all just stop dieting!